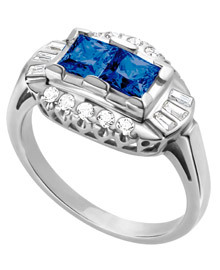 This elegant 14k white gold two stone engagement ring holds two 4mm blue sapphires in the center. Surrounding the two center stones are ten round diamonds that measure .01ct each and six baguette diamonds that measure .02ct each. All sidestones have a color of G-H, a clarity of SI, and a carat total weight without the center stones of 0.22 carats. Ring sold with center stones.